Naipes "MÓNACO" Anglo-American style playing cards, manufactured by Cía Gral Fabril Financiera S.A. 52 cards + 2 jokers in a special box, c.1960. 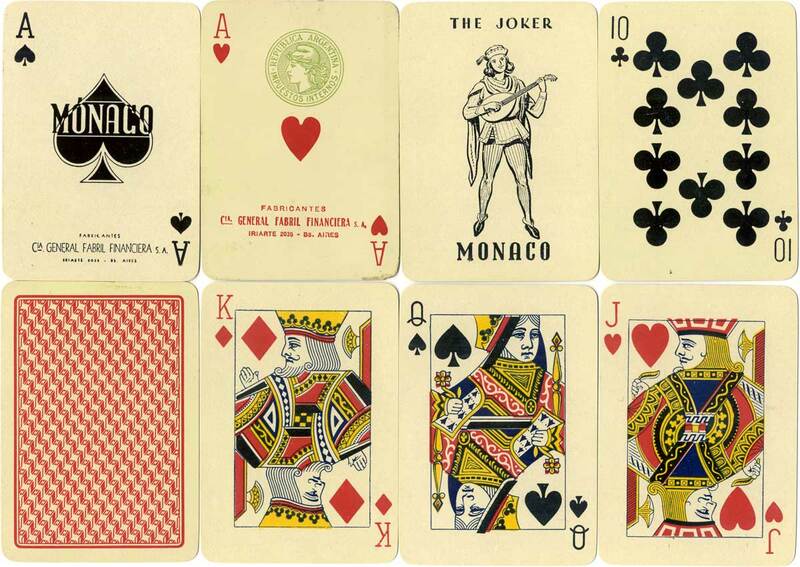 Above: cards from a lesser known brand, Naipes de poker MÓNACO, made by Cía General Fabril Financiera S.A., Iriarte 2035, Buenos Aires, c.1960. The ace of hearts has a green 'Marianne' tax stamp which was used between c.1953-1968. The two jokers feature a mandolin player. Fabril's more common Anglo-American brand was Naipes El Heraldo, which have the same court card designs based on those of Goodall.